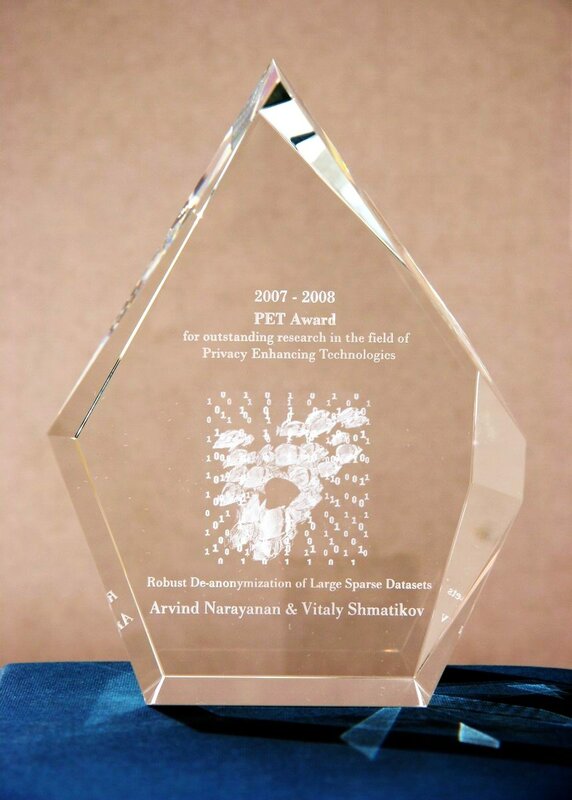 The PET award carries a USD 3000 prize, thanks to the generous support of Microsoft. The PET Advisory Board is grateful to Microsoft for encouraging privacy research through this prize. The prize also comes with a shiny statue like the one in the picture on the right, thanks to the Information and Privacy Commissioner of Ontario. Craig Gentry. Fully Homomorphic Encryption using Ideal Lattices. ACM Symposium Symposium on Theory of Computing (STOC) 2009. N. Homer, S. Szelinger, M. Redman, D. Duggan, W. Tembe, J. Muehling, J.V. Pearson, DA Stephan, S.F. Nelson, and D.W. Craig. Resolving individuals contributing trace amounts of DNA to highly complex mixtures using high-density SNP genotyping microarrays. PlOS Genet, 2008. R. Chow, P. Golle, and J. Staddon. Detecting Privacy Leaks Using Corpus-based Association Rules. ACM SIGKDD international conference on Knowledge discovery and data mining (KDD) 2008. S. Spiekermann and L. Cranor. Engineering Privacy. IEEE Transactions on Software Engineering, 35(1), 2009, pp. 67-82.